We’re LOVING learning Spanish around here! 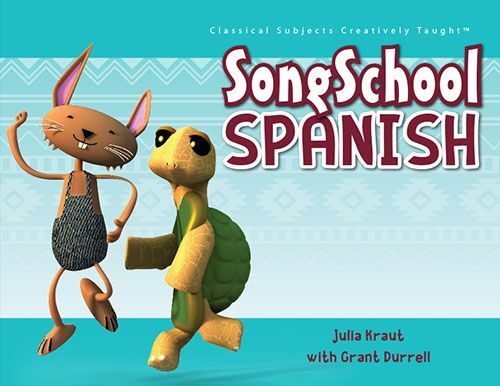 We reviewed SongSchool Spanish from Classical Academic Press. Katie saw it all come in the mail and wanted to begin immediately. She loves music and this just fits her to a T. She is able to read the lessons herself. She has a great aptitude for language. Tori, Alex, Katie, and I gather around the book as we listen to the CD and sing along. I think our favorite parts are the Tortuga (turtle) and Conejo (rabbit) songs and stories. The theme seems to be the fable of the tortoise and the hare with the first few chapters. We just love that. I ordered Tori her own student book so we could really do all the lessons together properly. The writing portions are easy enough for these 1st graders! It’s recommended for K-3rd. It’s helpful if the student can read and write in English fluently. My girls are having no trouble at all and really love it! The lessons/chapters are only a few minutes long each day and consist of a short conversational vocabulary list and a song or two, a short application, then a written portion perfect for primary students, with tracing or circling correct answers. It’s fun, light, engaging. After several lessons, there’s a cumulative review to make sure the student retains the information. The Spanish lessons reinforce English grammar, reminding students what nouns are in the classroom items list. My little English teacher’s heart is thrilled! We’re learning conversational Spanish with family names, things around the house, animals, and food. We’ve been listening to the songs on the CD to get familiarized even while doing other work. The girls walk around singing ¿Como te llamas? and ¿Como estas? They fill in family members’ names for the Yo me llamo song (My name is…). They liked having to ask all our family members how they are feeling: bien, feliz, or triste. And they’re labeling everything in the classroom and house in Spanish. They ask me what everything is and I can’t remember or the book hasn’t taught us, they want to look it up! The Aesop’s fable of The Tortoise and the Hare and the story The Three Little Pigs are familiar in English and make good examples in Spanish to learn vocabulary. There’s really no teacher prep and I don’t much need the teacher manual yet since I took several Spanish classes in school. The teacher manual has a script to follow that makes it super easy if you have no foreign language background. We go over the vocabulary. (I review past lessons just to make sure they remember!) We sing the songs listed for the lesson (and pretty all of them up to that point because they’re fun!). We go over the lesson, which is usually a story or conversation – even better with props if we have them on hand (like the rabbit and turtle or 3 little pigs or dolls for family members or play food, etc.). Sometimes I go through the lesson a couple times for emphasis. Then we do the practice (written portion) together. Sometimes the exercises are crafty (cut out “puppets” to use) or interactive (they have to ask each other questions) or grammar related (word origin and parts of speech) and they need a little extra help from mama. Those are my favorite lessons! That whole gender el and la is very different from English and we’ll need to review that extensively. Tori loves the Tortuga sign and holds it up for a song prop. Katie gets the Conejo song prop. We all sing the songs all day long. The girls now beg to do Spanish first every day. This is a huge hit at our house! I took 4 years of Spanish in school. I extend the lessons a bit, like asking them questions in Spanish…¿Como se dice…? (How do you say…) The lessons are super easy and teachers/parents don’t need any prior experience. The girls practiced the few lessons we’ve already learned on our Mexican youth pastor last Wednesday. They asked him how he was. They told him their names. They knew hello and goodbye in Spanish. Then they got shy. But he was impressed! aw, thanks! this one was easy since we loved it so much! oh, you dear! I was almost put on bedrest with my son. We had some complications during the first trimester, but they cleared up. I have three girls and I don’t know what I would’ve done! Is there a point when the docs feel the scares will be over and you can go back to normal? Praying for you and your family! We’re very much enjoying Song School Spanish. I bet their Latin is great too.